When this New Beautifully Baroque stamp (#130895) inspires me to feel Spicy... well, to imagine a Spice Market in some exotic local, lol. This was from one of my recent classes and was a Favorite... what do YOU Think?? OK So I ADORE when items coordinate!! Here our New Beautifully Baroque stamp set (#130895) coordinates with this Beautifully Baroque Embossing Folder (#130917) that with our Big Shot (#113439) create this beautiful look. The Apothecary Accents Framelits (#127003) and the New (and quite fabulous) Big Shot Magnetic Platform (#130658) that is a strong magnet - holding the Framelits EXACTLY where you want them!! 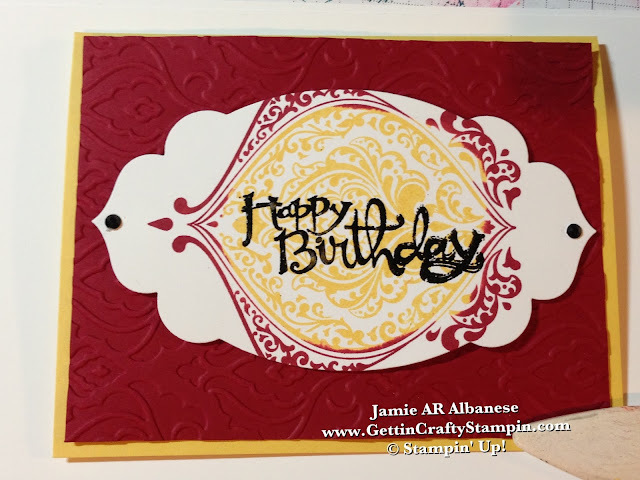 Here the Framelits cut a similar Spicy Feel out of our stamped Beautifully Baroque image. 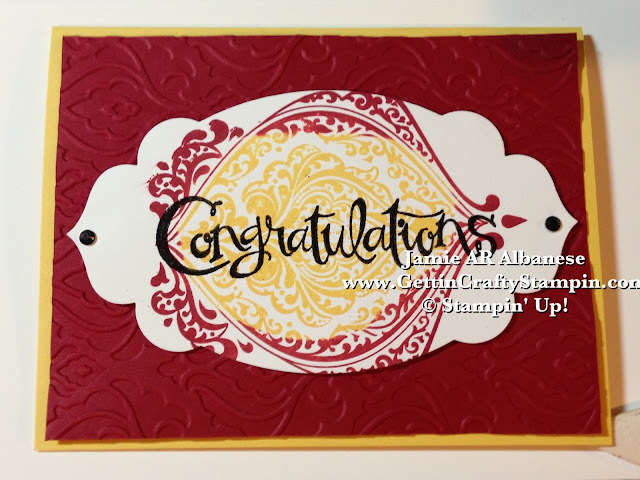 This Sassy Salutations stamp set is 25% OFF!! (Until the End of June - lol.) Click HERE to see our Promotions!! 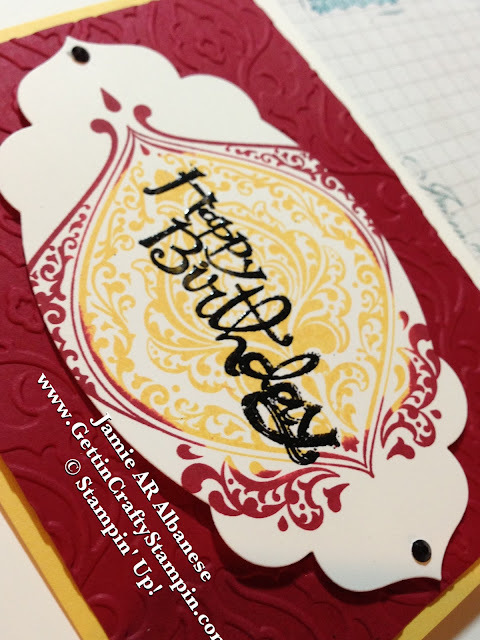 I Love that the Sharp lines mimic the lines in the Baroque stamp. Embossing in Black adds contrast and yet stands up to the bold colors. Our Heat Tool (#129053) and Black Powder (#109133) really lend to a quick and easy look. Colored Jewels... Permanent Markers quickly allow for our adhesive-backed Rhinestone Basic Jewels (#119246) create an Onyx like feel and coordinate with the embossing. Stamping my Stamp in the LIGHTEST color and then ROCKING and ROLLING it in a darker color allows for this variegated look. My Color Coach (#130120) is MY FAVORITE TOOL!! I love so many of our tools but the many years of stamping and I STILL rely on the color suggestions made by my Color Coach!! Here it paired up our Daffodil Delight (#126944) and Cherry Cobbler (#126925) for a WOW effect. Want to see this Rock N Roll Technique?? See this (Older/one of my first - wow have my videos improved - lol) video of mine... really, any stamp (flowers, shapes, etc) can have a Rock N Roll Technique like this.. REMEMBER.... You Can FOLLOW ME... with Many Video-How-To's on YouTube, Facebook Channel, Pinterest, Twitter, Instagram, LinkedIn, The Vine... and we can enjoy this walk we call life Creatively - lol! Let's Get Crafty...TOGETHER! !